Property Size 1,234 sq. ft. When our daughter, Amber, saw this vacation home, she so fell in love with it she asked us to buy her a home just like it! Nice and cozy with a cute little one car garage, what makes this home so special is the beautiful lake and conservation view from the private pool deck and the delightful architectural features which create interesting nooks and crannies throughout the home; including a wonderful little window seat in the master bedroom. Best of all is the incredible value. You can really stretch your vacation dollars yet still have all the amenities you expect from a vacation home--a fully equipped kitchen, dining area, spacious living room, washer & dryer, garage, and best of all your own private pool. 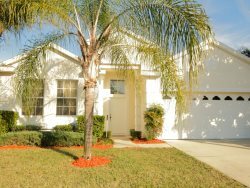 3 Bedroom/2 Bathroom Home with Private Screened Pool, Lake View, Conservation View, Pet Friendly, Master Suite, Washer/Dryer, Fully Equipped Kitchen, Free Wireless Internet, Expanded Cable, Close to Disney. Pool, Two Sun Loungers, Three Tables, Twelve Chairs, Lake View, Conservation View, Southern Exposure. A Disney entrance is only 4.9 miles away. Sea World, Universal, and the Convention Center are approx. 15 minutes beyond that. Beautiful house. Lots of room, great pool and very CLEAN!!!!! Close to everything. Great place for a stay near all the parks and local nature experiences. Great communication with the rental company. Really enjoyed the pool also. Would stay again. Thank you so much! "Florida Dream Homes" for great accommodations. This home was perfect! Pool was so clean and nice! Great cushions for loungers by the pool. And nice tables with umbrellas for enjoying pool area. We actually saw a bald eagle fly out of green space behind the pool. Kitchen well equipped...Home clean and neat. Living room furniture very comfy. Nice TV and book selection. We will hope this home is available for our next trip to Orlando. A special thanks to Lance for all his help with the perfect place to stay for our needs....and his office staff was amazing! We will return!